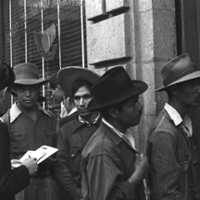 Drawn from the archives of Mexico's Secretariat of Foreign Relations, this stunning collection of black and white photography explores the Bracero Program as it was seen by the men and women who lived it. The photographs are part of a larger collection taken by the Hermanos Mayos, a renowned photojournalist collective comprised of five men who reached Mexico after fleeing the Spanish Civil War (Spain, 1936-39). Mexican historian John Mraz curated this traveling exhibit, pulling photos from the archives of the Hermanos Mayo to explore the immigration policies and personal stories behind the Bracero program. The program, which grew out of a series of bilateral agreements between Mexico and the US, brought Mexican men to the United States to serve as short-term, primarily agricultural guest works. They came starting in 1942 to ease labor shortages and production needs during the early years of World War II. Throughout the course of the program, which ran until 1964, approximately 4.6 million labor contracts were signed, making it the largest such program of its kind in the entire history of the United States. The exhibit highlights the history of the program and its ongoing impact on both countries, and contributes to our knowledge of immigration, nationalism, labor practices, race relations, and the lives of migrant workers. The exhibit is free and open to the public. For more information, visit the NHCC website.